Over the past two weekends I had the pleasure of attending both the Gales Storm Gathering in Wawa, Ontario as well as organizing the Georgian Bay Storm Gathering in Parry Sound, Ontario. This was the second year for the Gales Storm Gathering and since it rotates around Lake Superior from year to year this was the first time that it has run in Canada. That made for a bit of a challenge for organizers as it also happened to take place over Canadian Thanksgiving so sadly there were not a lot of Canadians registered. That was ok, the enthusiasm and excitement from gang who was there more then made up for the lack of Canucks. The Gales had an absolutely stunning set of instructors brought in for the event including Nick Cunlife (from the UK), Shawna Franklin & Leon Somme (from Washington state, Christopher Lockyer (from Nova Scotia), Keith Wikle, Ryan Rushton, Sam Crowley, Erik Ogaard and well, the list is to long you should go to the website to see everybody. Anybody who says that the Great Lakes don’t get ocean conditions has clearly never been to Lake Superior in October or November. Throughout the weekend we were under a gale wind warning with winds around 25-35 knots and surf coming in around 4-8 feet for almost the entire weekend. Because of the extra large surf at the mouth of the Michipicoten River on the door steps of Naturally Superior Adventures, we were able to make use of the several neighbouring beaches where the surf was a more manageable height of around 2-3 feet. A couple of highlights for me included co-instructing a beginner surf clinic with Shawna as well as tagging along for an ACA Level 4 instructor assessment with Ryan Rushton and Sam Crowley. For the assessment we went on a downwind run south from Wawa to Old Woman Bay in Lake Superior Provincial Park which was about 22km (13 miles) long. While out on the trip we experienced almost every type of weather condition including 25 knot winds, sunshine, clouds, rain, and sleet and finally snow. As soon as I got home after driving 12 hours, I threw all my laundry in the wash with just enough time to pack it up again and head out on the road again. This time it was north to Parry Sound to the event that I run, the Georgian Bay Storm Gathering. Now in its fifth year the Gathering has become a southern Ontario tradition for intermediate kayakers. Now I’m totally biased but I always look forward to the Gathering as one of my favourite events of the year. This year we had instructors from across Canada and the US including Gary Doran (from Victoria, BC), Kelly Blades (from Michigan), Ray Boucher and Dave Wells (both from Wawa, Ontario). We also had a huge pile of other amazing instructors so check out the website for the full list. Weather wise, we had pretty good winds throughout the weekend but because the direction was from the NE, we didn’t have the largest conditions (not like the Gales that’s for sure). That being said, there was more than enough lumpy water to run clinics on surfing, rocks, rough water rescues, etc. Though I would have liked slightly larger conditions, it was ok as we know how to make our own fun. Highlights included the annual dock launch, paddling in pea-soup fog and a serious match of pumpkin polo. If you haven’t seen pumpkin polo before, picture a large group of kayakers driving over each other while tossing around a medicine ball. It got pretty heated at times. So for me that ends the organized paddling season for 2012. We still have plans to get out and do a lot of paddling in November and December but I can finally take off my teaching hat and paddle for myself for a change. You need to check out this absolutely gorgeous sea kayaking short film that was put together from the gang at Kaspi Arial Media. The film follows Christine Utas, one of the instructors from the White Squall Paddling Centre as she paddles through the fog at Killbear Provincial Park. I don’t think I have ever seen Georgian Bay looking so good. If you are thinking of entering, you had better hurry as the cut-off date is August 31, 2012. You can find all the details on their website. I just got a sad email from my friend Tim, owner of the White Squall Paddling Centre in Parry Sound, Ontario. Due to recently announced Federal Government budget the Georgian Bay Biosphere Reserve found out that their funding was cut for 2012-2013. Sorry to bother you, but the Biosphere needs your help. They have had their core funding cut to zero – effective this year. It means Greg and Becky don’t have funding to continue unless something happens. They have come up with an innovative and simple funding effort called the $57K campaign. Basically, they need $57,000 to get through this initial crisis – and they are asking for donations of $57 in the hopes that 1000 people will heed the call. It’s not huge for each of us, but will make a huge difference for the continuing of their work. Designated by UNESCO in 2004, the Georgian Bay Biosphere Reserve is an area of 347,000 hectares that stretches 200 km along the eastern coast from Port Severn to theFrenchRiver, in the world’s largest freshwater archipelago, also known as the 30,000Islands. The unique geography and geology of the area create more than 1,000 distinct habitat types which support a variety of rare species, including plants, mammals, birds, reptiles and amphibians. So far they have been able to raise $2,000 but still have a long way to go. The GBBR is a fantastic organization and have been extremely supportive of the sea kayak campers who use the area. I’m opening my wallet, are you able to help? You can learn more as well as contribute here. Taken on the Bustard Islands in Georgian Bay, Ontario by Bryan Hansel. 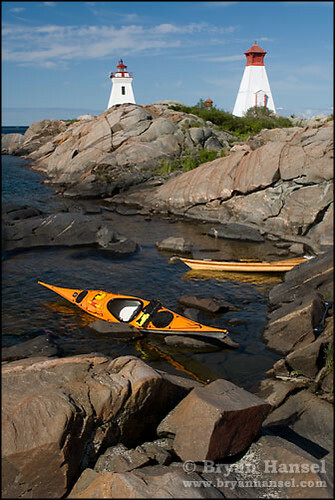 Found in the Sea Kayak Canada Flickr Group. Check out his amazing photography portfolio here and website/blog, paddlinglight.com.